NEWS: remaining 4 shows selling fast. Fri Dec 14 is SOLD OUT. Friday Dec 1 to Saturday Dec 15, 2018. Times: Wed to Sat at 8:00 pm. Sun matinées Dec 2 & Dec 9 at 3:00 pm. Tickets: Adults $25, Child 14 & under $10. To reserve call 905-543-8512. On-line ticketing no longer available. 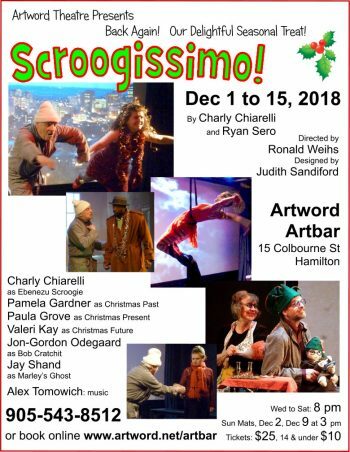 Artword Theatre’s delightful Christmas comedy Scroogissimo returns for a fourth time to Artword Artbar. 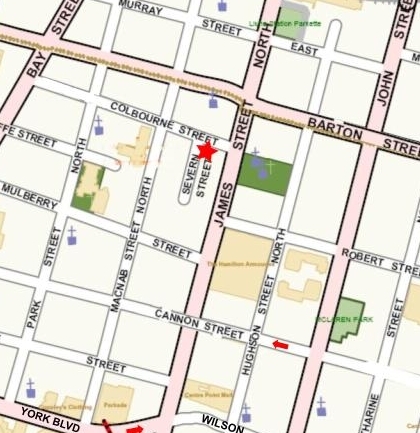 Hamilton’s North End meets Charles Dickens in a wacky script by Ryan Sero and Charly Chiarelli, directed by Ronald Weihs. A sell-out hit in 2013, 2014 and 2016, Scroogissimo features Charly Chiarelli as “Ebenezu Scroogie”, a Christmas-hating old Hamiltonian from Racalmuto, Sicily, who finds himself haunted by three ghosts of the Past, Present and Future. Our favourite review, from the first production in 2013: “Artword Theatre is cramming a whack of seasonal fun into their tiny package of a space. 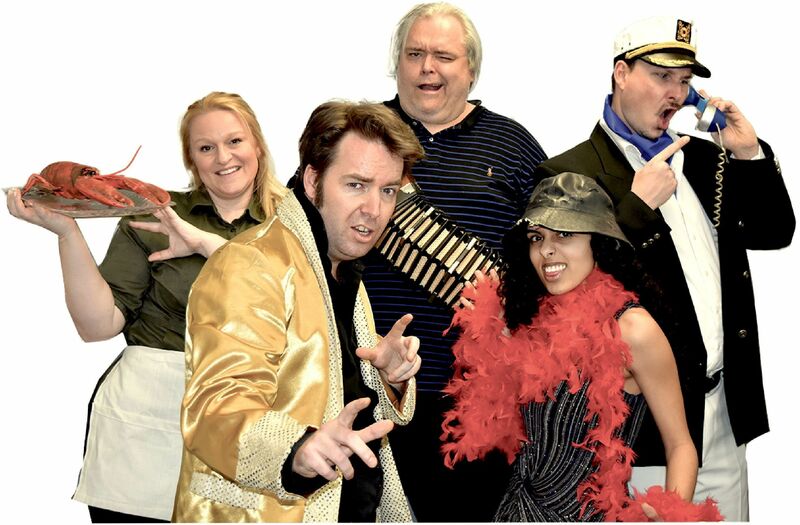 Mixing local Sicilian–Canadian storyteller Charly Chiarelli and “Charly” Dickens makes a Christmas–cracker exploding with musical and comedic goodies that will make an addition to your festive season you will never forget….” Robin Pittis for View Magazine. CANCELLED/ Unfortunately we are not able to proceed with this planned reading. We will try again in 2019…. July 19 to 28, 2018. 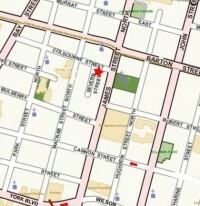 Part of the Hamilton Fringe Theatre Festival. The Man in the Vault (Artword Theatre). A Russian spy defects with information about Lee Harvey Oswald and the Kennedy assassination. James Angleton, the CIA’s legendary head of counterintelligence, is convinced he is a disinformation agent sent by the KGB. The defector is kept in a concrete vault in a secret location while interrogators try to extract the truth from the man in the vault. Based on true events in the 1960s that resonate with today’s headlines. The Decision (Gallery on the Bay). Performed by Jordan Campbell and Jason Thompson. Amsterdam, May 16, 1940: Two young officers in the Royal Netherlands Army meet secretly. Their orders are to report to Gestapo Headquarters in the next morning. Romeo & Juliet: An Escapist Comedy (Make Art Theatre). Performed by Tyler Brent, Natalia Bushnik, Kristian Reimer, Ryan M. Sero, Liz Kalles, Laura Welch. Written by Ryan M. Sero, Directed by Tyler Brent. Winner of the Critics’ Choice Award at the 2014 Hamilton Fringe! The sell-out fan favorite returns! Romeo is distraught: his girlfriend just dumped him, he can’t find meaning in the universe, he’s worried there is no God, plus he can’t even get a table at Steinman’s! Shakespeare meets Woody Allen in this comic re-imagining of the Bard’s classic tale. Comedy, All Ages, Running Time: 60 minutes. The Fringe 2017 hit musical Swingin’ In St. John’s returns for a two-week run at Artword Arbar. What if they made an Elvis movie — set in Newfoundland? It’s back and bigger than ever! More singin’! More dancin’! More swingin’! Two brand-new songs, plus the 16 original songs and two Newfoundland classics. Come get Screeched In with us! and Susan Robinson as ‘The Lobster’. Written, composed, designed & choreographed by Will Gillespie. Paintings, props and puppets by Susan Robinson. Video and lighting technician Judith Sandiford. 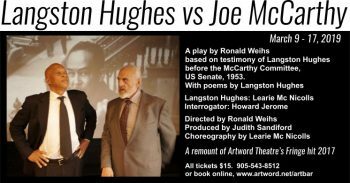 Thursday February 22, 2018, from 7 to 9 pm, free (call 905-543-8512). 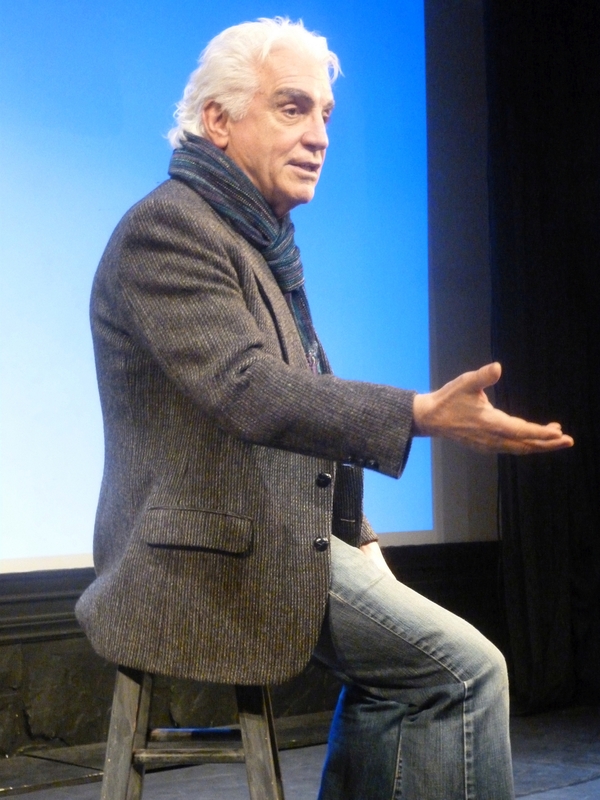 Reading of a new script-in-progress by playwright, screenwriter and director Kevin Land. Readers are: Deanna Stevens, Martha Christianson, Aimee Kesler Evans, Janet Kompare Fritz, Greg Flis, Carlos Jiminez, John Land, Dean Rooney, Julian Nicholson, Paul Rivers. Attentive listeners with an interest in theatre are welcome to attend. Seating is limited, call 905-543-8512 to reserve. “Static” is a film script about a musician who has never been able to forgive himself for his responsibility in the death of his wife and six month old baby while driving home late after a gig over 25 years ago. Having rejected music, alcohol, and human connectedness in the intervening years, Mitch, now retired as a letter carrier, rents a recording studio to put down nine songs he wrote in the ten years after the accident. There he works with a trans woman who is an intern sound engineer and in the process, the two form a bond out of the redemptive, communal, and restorative nature of music. Wednesday February 21, 2018. Artword Artbar will be closed to the public today. We are holding OPEN AUDITIONS for several upcoming theatre projects by Gallery on the Bay and Artword Theatre. Gallery on the Bay is seeking to fill two roles for men in 20s-30s age range. Artword Theatre doing Get Acquainted auditions for a variety of possible projects, for men and women, any age. To make an appointment for an audition, email: artword@artword.net. They say it takes thirty years to become a master at something. 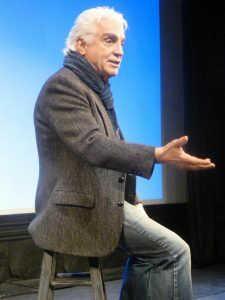 I can confirm then, that Charly Chiarelli, the Sicilian born, North End Hamilton native, whose newest play, Charly’s Piano, opened this week at Artword Artbar, certainly has the skills to hold an audience spellbound with a yarn. Want to go back to the early ’70s? To a time when Ian and Sylvia, Bo Diddley and Ronnie Hawkins sang at the Concord and other hallowed Toronto halls? Coffee houses and bars were still the domain of beatniks and hippies back then. Toronto was less sophisticated than it thinks it is today. Possibilities were endless. In 1972, Charly Chiarelli, born in Racalmuto, Sicily, but raised in Hamilton’s gritty North End, found himself wandering the streets of what was once called Hogtown. December 7 to 16, 2017. Charly’s Piano, Charly Chiarelli’s heartwarming Christmas show about how he organized a fundraiser to buy a piano for the Clarke Institute of Psychiatry in 1972. An Artword Theatre Production, directed by Ronald Weihs. Charly’s Piano is the true story about how Charly went to work as a psychiatric assistant at the Clarke Institute of Psychiatry in Toronto. The year was 1972, Toronto was full of music and hippies, and the Clarke was exploring new techniques in mental health. Charly, harmonica and all, fit right in. Pretty soon, he’s organizing a fundraiser to buy a piano for the patients to play. At first, no one signs up, but when the “Cat Lady” says she’ll sing a song, the idea takes off. Patients, doctors, nurses perform in a sell-out concert. But the story isn’t over. Charly and a patient known as “The Duchess” travel by public transit to a mansion on the outskirts of Toronto and buy the piano. And at Christmas, the piano is in the lounge, where Charly leads patients and staff (and audience) in Christmas songs and carols. Script by Charly Chiarelli and Ronald Weihs, new songs by Charly Chiarelli on harmonica with Ronald Weihs on guitar. Produced by Judith Sandiford. Reserve 905-543-8512 or Book online. 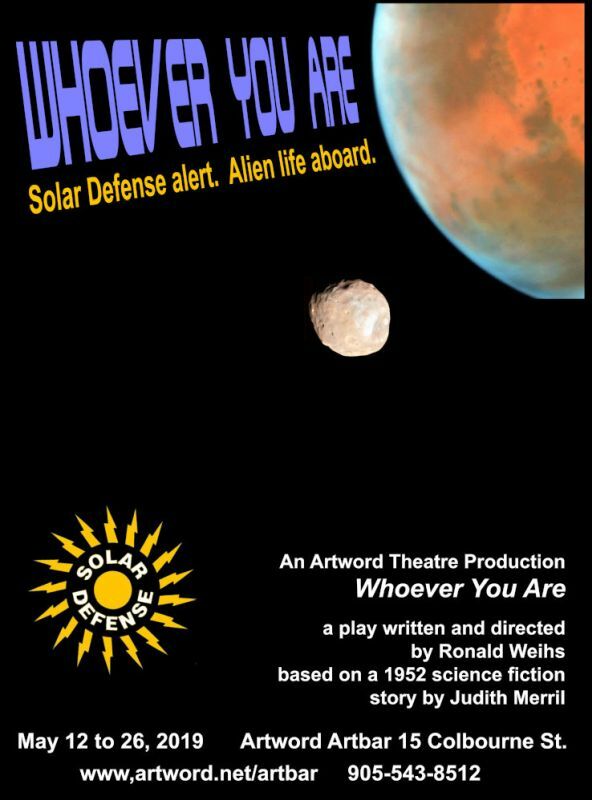 Tues to Sat, December 12 to 16, at 8 pm, $20. 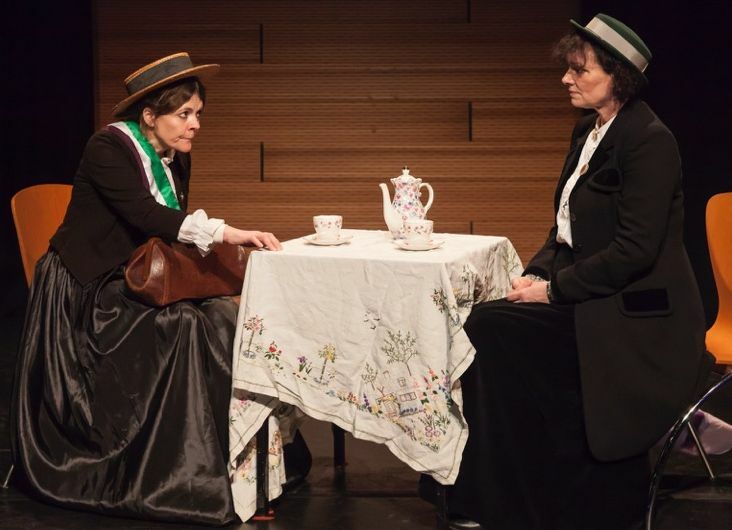 The Two-Show Deal: If you came out to Cu’Fu? and loved it, you are eligible for the two-show package discount. By phone only: 905-543-8512. 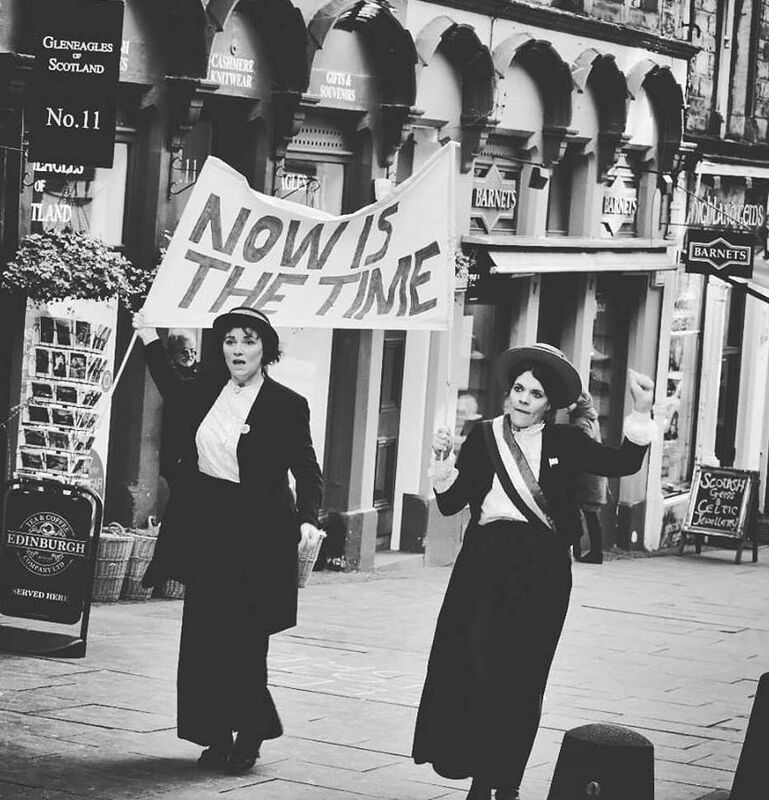 This Fringe show was a real gem and a pleasant surprise. 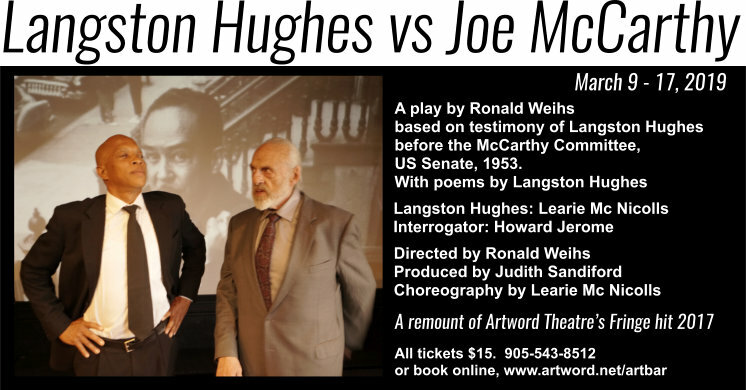 Writer/Director Ronald Weihs takes us back to 1953 when Harlem Renaissance poet Langston Hughes was summoned by infamous Senator Joseph McCarthy to speak to the Senate Committee on Investigations. Combining projected pictures from the era, jazz music, movement and two amazing actors Weihs transports his audience into both a frightening and inspiring time and place. A time and place that reminds us of the fragility of our democracies as we still so easily allow ideological demagogues to take away our collective powers.